Even before they released specific plans, it was obvious that Bernie Sanders and Hillary Clinton had very different philosophies for improving our health system. Clinton promised an incremental approach: new regulations and funding to fix issues that Obamacare missed, but otherwise keeping the current system. Sanders proposed something much more radical: eliminating private insurance entirely, and covering everyone under one single-payer system. It’s a great idea in theory: everyone gets an insurance card that they can take to any doctor or hospital in the country. No more worrying about whether you have insurance, whether a provider is in-network, or whether your claim will be denied. Single-payer also saves money thanks to lower administrative costs– hospitals don’t have to bill hundreds of different insurance plans, each with their own rules– and by negotiating for better prices from drug companies. Canada and a few other countries have shown that a national single-payer plan can work; they spend much less per person on care than us while covering everyone. The hard part is figuring out how to get there from our current system. To switch to single payer you need to (1) figure out what services will be covered for every single American, keeping in mind that every benefit makes the plan more expensive; (2) set taxes and out-of-pocket costs so they’re affordable for every family; and (3) decide what to pay providers (set prices too high and the system is too expensive to sustain, set them too low and you force some doctors and hospitals out of business). Balancing all these variables is tricky, especially since the numbers are enormous. Over the next ten years we’re expected to spend over $40 trillion on health care, so a few percentage points here or there can mean the difference between a working system and an economic crisis. Bernie calls his plan Medicare-for-all, but it covers much more than Medicare currently: dental, vision, hearing, and long-term care are all included in Sanders plan. Sanders’ plan would also elminate out-of-pocket costs entirely, so no more deductibles, copays, or coinsurance for anyone. This was the most surprising part to us. Right now deductibles are obviously too high for many families– even people with insurance are struggling to pay medical bills– but some cost-sharing does reduce demand for unnecessary care. (If you pay nothing out-of-pocket, you might not think twice about going to the ER for an itchy throat, or getting a third MRI for a headache the doctor insists is nothing.) Doing away with out-of-pocket costs altogether increases the cost of Bernie’s plan dramatically. Savings on tax expenditures ($310 billion). Medicare recipients would also make out. Bernie’s plan would eliminate the deductibles, premiums, and coinsurance they’re currently responsible for, while expanding their coverage to include hearing, vision, preventive dental, and long term care– all for just 2.2% of their income. Before Sanders released his health plan, the website Politifact did some back of the envelope calculations based on his 2013 Senate bill. They found that a 2.2% income tax would generate between $126 billion and $150 billion (and that includes taxing families making below the poverty line, who, according to Sanders, would be exempt). That’s $60-$80 billion short of what Sanders’ plan says. Similarly Sanders expects the payroll tax to bring in $630 billion. According to Politifact’s figures (which are based on a higher payroll tax of 6.7% that Sanders proposed in 2013) this part would generate just $432.5 billion, a $200 billion difference. We’re not tax experts though, and while Politifact was transparent in its its math, we wondered if they missed something important, like inflation or population growth, that would account for the shortfall. But recently some tax experts, the Committee for a Responsible Federal Budget (CRFB), did look at Bernie’s plan, using estimates from the Congressional Budget Office and Joint Committee on Taxation. They found that the plan’s taxes will generate $300 billion less than what Sanders claims. Still that’s not even the biggest number that’s unaccounted for. Under the “How much will it cost?” section of Bernie’s plan, there’s just one sentence: “This plan has been estimated to cost $1.38 trillion per year.” Seriously, that’s it. The U.S. is expected to spend about $41 trillion on health care over the next ten years, and roughly half of that currently comes from the government. To move all other spending onto the federal side and expand what’s covered for just $1.38 trillion per year, he’d need to cut health spending by 25%, or roughly $1 trillion dollars annually. Sanders’ staffers did provide a bit more detail when speaking to Dylan Matthews at the website Vox. The campaign was responding to an analysis from Kenneth Thorpe, a professor of health policy at Emory University, which found that Bernie’s plan would cost about $2.47 trillion per year– nearly twice what Bernie claims. Administrative costs: Friedman, the one who did the original analysis for Sanders, told The New York Times that lower administrative costs would reduce total health spending by 10.7%. Meanwhile, Sanders’ policy director, Warren Gunnels, told Vox that lower admin costs would reduce it by 16%, then later revised to 13% in an email. That’s three totally different estimates from the Sanders’ campaign; and while a few percentage points may not seem like a big deal, the difference between each of them is $120 billion annually. To get a sense of scale, that’s equivalent to all of the spending in the Affordable Care Act. Drug savings: Gunnels originally told Vox that Bernie’s plan would save $324 billion in prescription drug costs every year. Thorpe pointed out that total national drug spending is only $305 billion annually, which means the pharmaceutical industry would have to fill every prescription in America for free, plus pay the government $20 billion a year to boot. When Vox pointed out that this seemed… unlikely, the campaign lowered its estimate to $241 billion in savings. That’s still a massive 80% cut in prescription drug spending, with no explanation of how you could do it without putting most drug companies out of business. Sanders assumes $160 billion per year in savings relative to Thorpe because, they argue, he includes elective procedures like plastic surgery, which single-payer wouldn’t cover. Thorpe disputes this: “Cosmetic surgery, really? That’s $12 billion a year and in the second decimal of rounding.” In other words: There’s no way excluding plastic surgery can give you $160 billion of savings. Increased usage: Thorpe assumes that eliminating deductibles and copays will increase usage by about 10% in private plans. At first, the campaign said spending will only go up 6% due to increased utilization, for a difference of about $216 billion, but revised that to $660 billion, apparently assuming no change in utilization. Like we said earlier, Thorpe’s estimate may be too high, but Sanders’ revised estimate makes no sense. David Himmelstein and Steffie Woolhandler, both professors at CUNY’s school of public health and members of Physicians for a National Health Plan, have defended Sanders’ plan, arguing that Thorpe’s cost estimate is too high for a bunch of reasons. But even if you accept all of their assumptions completely, Sanders’ plan would still cost much more than he says. Meanwhile, on the revenue side, it’s even harder to argue that CRFB is wrong, since they’re using numbers from the CBO, the nonpartisan agency that would provide the official budget estimate for the plan if Sanders put it before Congress. Still it’s possible that Sanders’ estimates are plausible. The only way to tell would be for the Sanders campaign to clearly explain the reasoning behind its numbers, just as Thorpe, the CRFB, and Himmelstein and Woolhander did in their analyses. All of this is incredibly depressing if you believe, like we do, that a single-payer approach deserves serious consideration. It’s so rare that single-payer gets this much attention in national politics, so you’d hope that the specific plan that people are discussing is one that doesn’t rely garbage math and magic asterisks. Unfortunately it’s looking more and more like that’s not the case with Bernie’s. I’m not surprised that people can pick apart Sanders’ numbers, given that candidates generally don’t have the resources necessary for airtight budget figures for anything as complicated as healthcare. But, as you say, we all agree that single-payer would be better for lots of reasons, including lower overall cost, so I’m afraid that your piece really comes across as support for Clinton, although I agree that there may be more important things for the next presidcnt to do that are more likely to be successful. I do agree with you that co-pays are likely to be essential to keep costs down. It all has to start somewhere, and you know as well as I it won’t work right at the start. but some one has to start it so why not Sanders. I am sure by the time congress gets done with it there will be many changes so I wouldn’t’ worry about the math now. thanks for the detailed analysis, Rob. There is another fuzzy number, namely the savings on tax expenditures of $310 billion. Under the Sanders plan, employers would no longer be paying premiums to insurance companies. Right now let’s assume that employers pay $900 billion in premiums, and this is not taxed to workers. 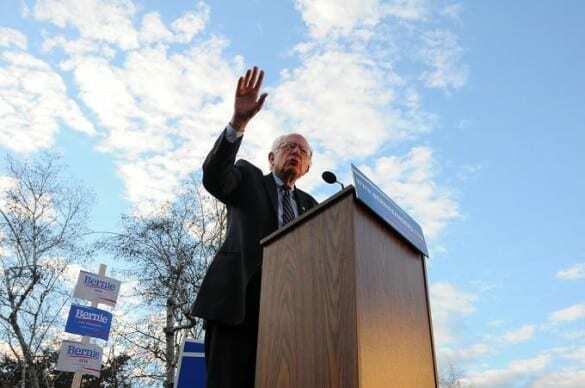 OK – the Sanders plan goes into effect. Employers still have to pay 6% roughly as a payroll tax. But for those employers who have been paying more than 6%, this is a windfall. Will these employers suddenly raise workers salaries by the difference between 6% and what they have been paying? Even if they did, the new revenue to the IRS from workers will not be $310 billion. @Bob: Yeah, I was wondering about that myself, but I think it might be ok. The CBO says that health tax expenditures are equal to 1.8% of GDP, which would be about $300 billion. Which makes sense– the total average tax rate on wages is currently like 30% (including current payroll taxes, SS, Medicare, and income tax), so if you figure employers were spending $900 billion in premiums, and that’s now taxed at 30%, then revenue to the IRS would be pretty close to $300 billion. But like you said, that’s assuming that employers give raises equal to what they were paying in premiums. Economic theory does say that’s what would happen… eventually. But it would still likely take years for wages to catch up, which means that in the meantime, that health expenditure revenue would be less than $310 billion per year. It’s hard to say how much less though, which is maybe why the CRFB report let it slide. And since eventually wages should rise to equal what employers were paying in premiums (again, in theory anyways), I think it’s ok for the campaign to cite that $310 billion figure. @John: The problem’s not that his numbers aren’t airtight– it’s that some of his figures seem totally unrealistic, and there’s really no explanation of how he got them. It’s a huge amount of money, so I don’t think it’s unfair to ask Sanders for some detail on how he plans to cut $1 trillion in health spending per year. And I think providing those answers would also help the single-payer movement. There are legitimate questions about how you’d move to single-payer from our current system (that mostly center around cost)– if single-payer proponents are serious about getting something passed, it’s something they have to address. Year – Total US Income. So for 4 years the USA has seen an increase in income for all residents who files taxes of an average $576,150,000,000 per year. This will be important. 2017 = 16,434,900,000,000 <— If elected, first year. So lets figure out Tax revenue for single player system now that we have a baseline on the economy for the last 4 years of growth. $15 Trillion needed – $15,980,895,000,000.00 Obtained. Looks like there is a $980.9 Billion surplus too. @Jason: You can’t just apply the two tax rates in Bernie’s plan to the total U.S. income. For the personal income tax it doesn’t work because the IRS taxes adjusted gross income, which is much lower– about $8.5 trillion in 2013. For the “corporate tax” it doesn’t work because total income includes income from all sources (like wages, capital gains, welfare, SS, etc. )–the “corporate tax” is actually a payroll tax, meaning it only applies to wages, which, again are only a portion of total U.S. income. Anyways, the Congressional Budget Office already did the math using the correct figures (and they do take income growth into account)– those are the numbers that the CRFB uses in its analysis. The CBO estimates that a 1% payroll tax increase would raise $800 billion over ten years, and a 1% income tax increase would raise less than $700 billion over ten years– so for Sanders plan, the income tax generates about $150 billion per year, and the payroll tax brings in $500 billion per year, for a total of $650 billion annually. @Rob Cullen Agreed, the problem is not that Sanders’ numbers are optimistic. The problem is that they are so optimistic that independent analysts are showing completely impossible results (initially more money is to be saved out of prescription drugs than we spend on prescription drugs etc). The Sanders’ approach can’t be replicated where the differences between their numbers and process and an outsiders’ number of process is a matter of contesting whether a particular knob is turned to 7 or 8. Next post: Hillary Clinton wants universal coverage– but what’s her plan to get there?